Today, our judo friend wdax participated in and won the gold medal in jû-no-kata during the European Kata Championships the Lignano in Italy. Please, join me in congratulating wdax and partner for their hard work and commitment. 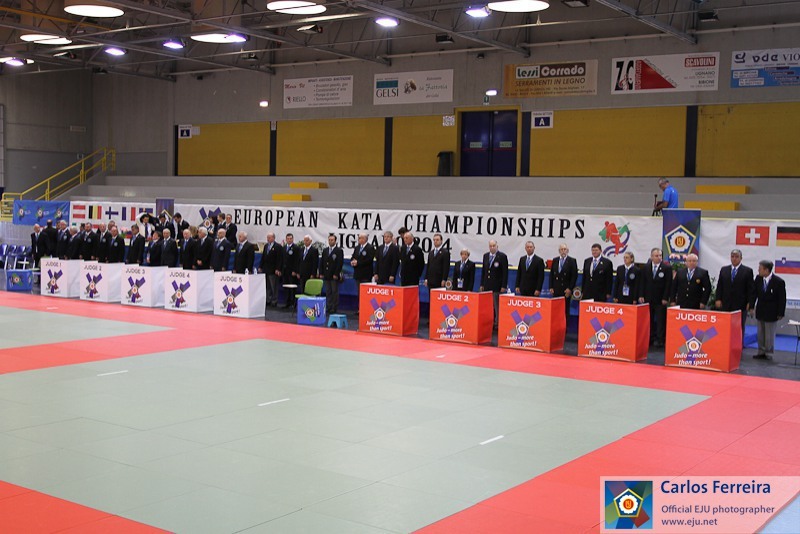 Another positive thing to mention is that the EJU reverted to traditional tatami colors for the kata contest ! This was a great decision and after years of despair finally restored some of the classical kata atmosphere. Having to perform kata on yellow/blue tatami has been awful, disorienting, sometimes your eyes would just hurt. He's a picture of the contest tatami lay-out. I think this is the best one can get and if the IJF wants to stick with the dynamic border lay-out (not necessary for kata anyhow) then this is the best possible lay-out. I hope that in the end the IJF will follow the same example and slowly start replacing the blue/yellow tatami disaster. Congratulations to wdax. That is most commendable. Today another gold in open competition. I was particularly glad (and proud) that our friend wdax beat the Romanian girls. The Romanian girls perfectly illustrate one of the things that is so wrong with kata. Essentially they perform like gymnasts, attempting to impress the audience by showing how extreme things they can do with their bodies, which has nothing to do whatsoever with the kata. It is a good thing that at least --to some extent-- the judges did not all let themselves being tricked by that. Hopefully this should give some additional satisfaction to wdax and partner who will return from this championship as one of only 4 couples who won a double gold-medal at this championship. I hope that some positive developments and improvements at this kata championship --after many years of sheer frustration-- will continue in the right direction. Congratulations Wolfgang! See you in Malaga! Thanks everybody for your nice comments. One of the most important things about this (and former) champiosnships is, that these events bring people of different countrys together and in this way they help to create a world, which is a little bit more peaceful with every event. Every year we get in contact with new kata-friends and some of the guys we meet, we know for years now. It´s always great to meet them. I´m looking forward to meet as many as possible in Japan at the summer course and at the WC in Malaga in september.